Felen Relas, a Dunmer alchemist, is an Evoker of the Mages Guild who offers basic alchemy training at the Anvil Guild Hall. He enjoys a relaxed lifestyle: from 8am he will start mixing up potions using his mortar & pestle, behind his counter in the first floor of the Guild building. At 4pm he decides to start reading, and heads to the other side of the ground floor to find an interesting book. He reads until he goes for dinner at 9pm. After three hours eating he heads for his bed in the Guild Library, where he sleeps until 8am of the next day. He has a Mercantile skill of 30 and 600 gold. He will buy ingredients, potions, alchemical apparatus, and miscellaneous items from you while only selling magical supplies. He will offer both training and his bartering services at all times except when eating and sleeping. He wears upper-class attire, consisting of a blue velvet outfit and a pair of blue suede shoes. He also carries a small amount of gold, his book, his mortar & pestle and an empty grand soul gem. He doesn't wield any weapons, relying instead on a set of leveled alchemist spells. He will introduce himself by saying: "I'm Felen Relas of the Mages Guild. I handle Alchemy training for the Anvil Chapter." If you aren't in the mages guild, Felen will tell you about it, as well as wondering how others cope without magic: "I can't imagine how the average person gets by without our extra services. No spell-crafting, and no enchanting? It must be awful." If you ask him about Anvil, he will say: "If you're looking for hard-to-find ingredients, try Lelles' Quality Merchandise, outside the walls facing the harbor." 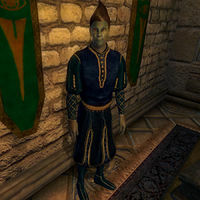 As an alchemist, he will point you towards Sinderion if you show him a sample of nirnroot: "Have you taken this to Sinderion in Skingrad yet? As far as alchemists go, you couldn't ask for a more knowledgeable source. If anyone can help you identify this root, he can." His skill as an alchemist is well-known among the townsfolk of Anvil. "Learning a bit about alchemy would be handy, but you have to be in the Mages Guild for Felen to train you. ", "If you're looking to learn a bit about potion-making, you should speak to Felen Ralas [sic] at the Mages Guild", "I've heard that Feren [sic] Relas knows quite a bit about alchemy." and "Might be nice to learn a bit about making potions" are all rumors that you will hear around town. He owns the items found on his counter; these include two copies of the standard text Fundaments of Alchemy, two empty soul gems, and two scrolls. This page was last modified on 27 March 2015, at 23:14.